"Atlantic VI" made a 1660-mile voyage (800 miles in open Ocean) from MetalCraft's shop in Kingston, Ontario to Wilmington, NC last month. The 6-1/2 day journey was the longest water delivery made by MCM. The boat is powered by twin CAT C-18's 885 HP @ 2200 RPM and 364 Hamilton jets, and is capable of speeds of up to 40 knots. With the Hale twin 3000's, Wilmington pumps close to an impressive 7000 GPM. Atlantic VI has the latest technology in foam control and distribution with its 8-position/8-panel Foam System by FoamPro Accumax. It carries 500 gallons of foam aboard and has 16 dischargers with 4 x 5" landline connections. Assistant Chief Ron Jordan and his team are very excited about the new arrival, which was commissioned July 23rd. 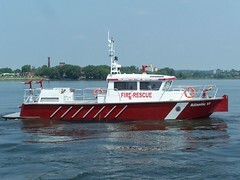 Five years ago, MetalCraft produced the first FireStorm boat and has not turned back. Each boat having a unique and personalized flavor chosen by our customers. We have been designing and building boats, both power and sail, since 1978 and stand behind our 10-year hull warranty.